At noon on water and started trolling north approximately mid lake to the Weber point. Was going east to west and back across the lake. Lots of sun, very calm lake. Bugs were sitting on the water with no even little movement. With all that sun, I did not expect and did not see any risers, so I started searching in 5-20 ft range. 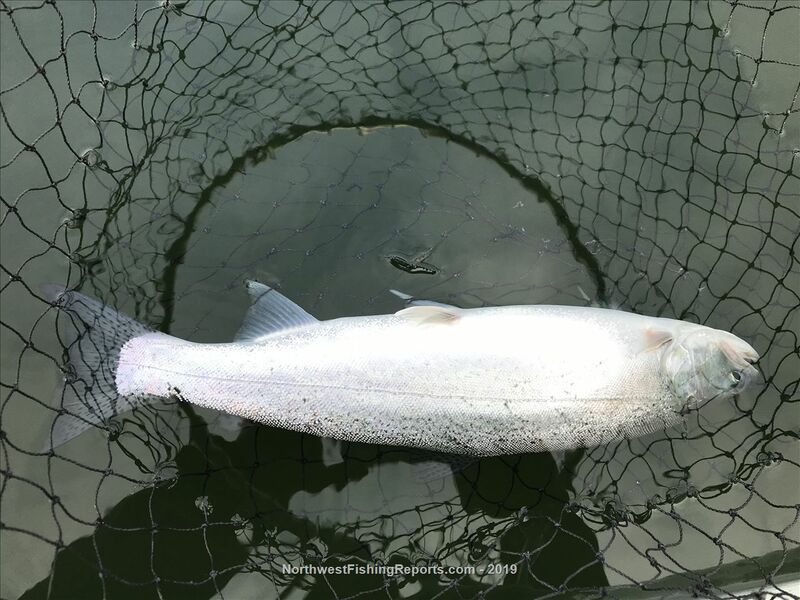 At 1207 and 10ft, caught a hatchery landlocked coho (first pic) with clipped and healed adipose fin (second pic). I tend to think kokanee have not figured out self-clipping yet, so I go with a coho. Then the lake went radio silent for about two hours. Around 1400, I was in the Weber point area and noted a few risers (just a few). Kept my setup at 5 ft. I heard a theory that smaller fish feeds on bugs and larger hanging round a bit deeper. At 1429, I get a nice cut with some colors in 14-15” range (third pic). Not sure if it confirms the theory but the fish was caught. Proceeded trolling at 5 ft and got a salmonid at 1437 (forth pic). It could be a kokanee or a coho. 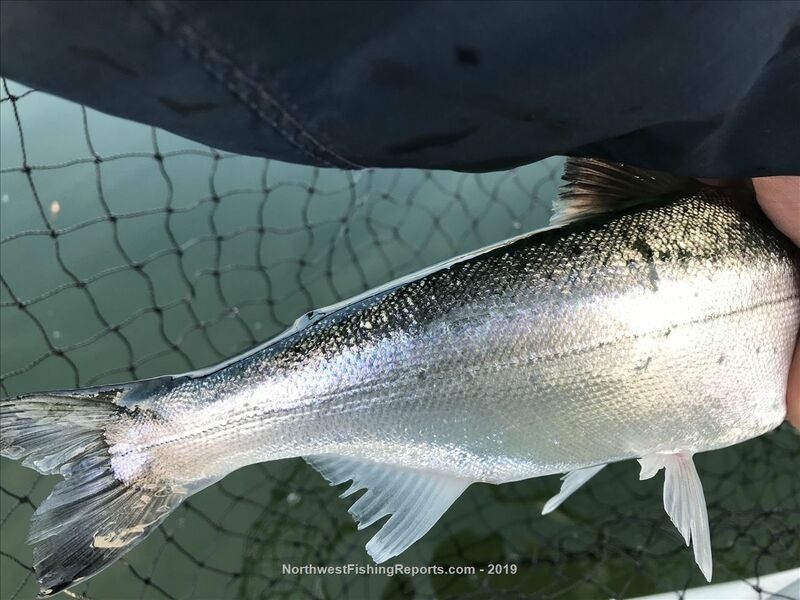 For me personally, that fish’s mouth did not look like fragile and soft kokanee mouth but it is a moot point because of the fin. Proceeded trolling at 5 ft and caught a really nice cutthroat in 16” (conservatively) range at 1506 (fifth and sixth pics). Nice thick back. There was a little 6” fierce for its size cutthroat between the salmonid and the cutthroat but I did not bother to take a pic. Kept trolling for other half an hour with some hits but no hook ups. 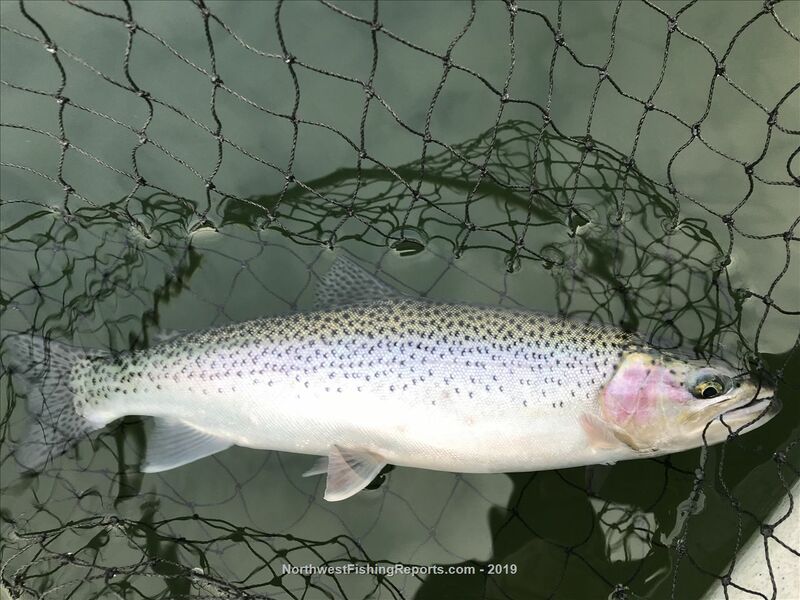 I rated the trip four starts because a rating is directly proportional to a number of fish caught or even kept – for most people I tend to think it is the case. However, it was truly five star trip with given very nice weather and almost complete solitude on the water (saw just 5 or 6 boats at good distance). I was using a pink beaded spinner the whole trip. I think you must have been fishing near us in that time period. I started out shallow, but marked fish deeper and ended up consistently catching from 25 to 35ft the most. Had a couple of doubles and almost a triple at one time, so decent fishing although it was a bit quiet between fish. Didn't catch very many coho. Not that it mattered to me, as I wasn't keeping any fish. But we all had fun on a nice day on the water and catching was the icing on the cake. I am so very jealous and will make it back out there soon. Calm winter days on the water are so beautiful on Sammamish. Great report! 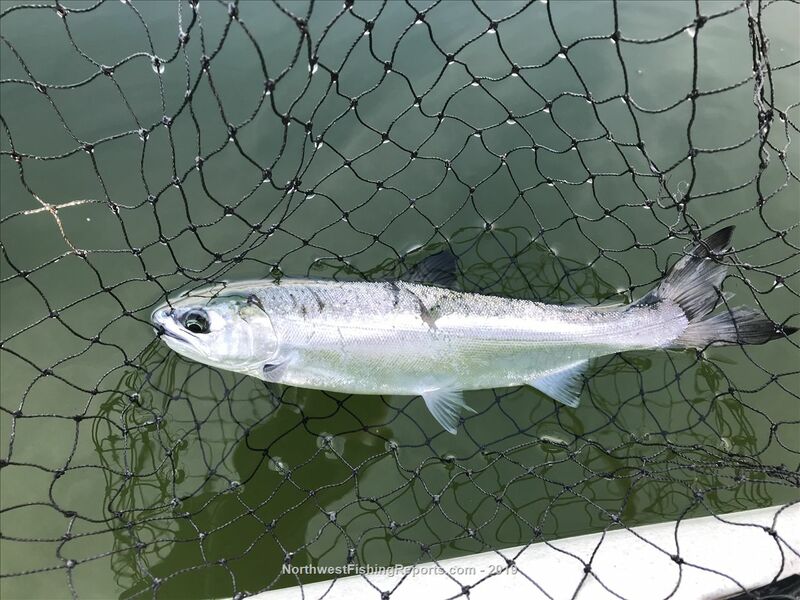 That fish that you are curious on is a coho. It’s wild, so it can’t be kept but it is a gorgeous fish! Fantastic seeing success! Great fishing and tight lines! Yes, I go with coho as well. After catching my share of kokanee over years, I do not think I can mistake fragile kokanee that falls apart before you even look at them. These cohos fight. I keep them in a net for a minute so they calm down before unhooking. 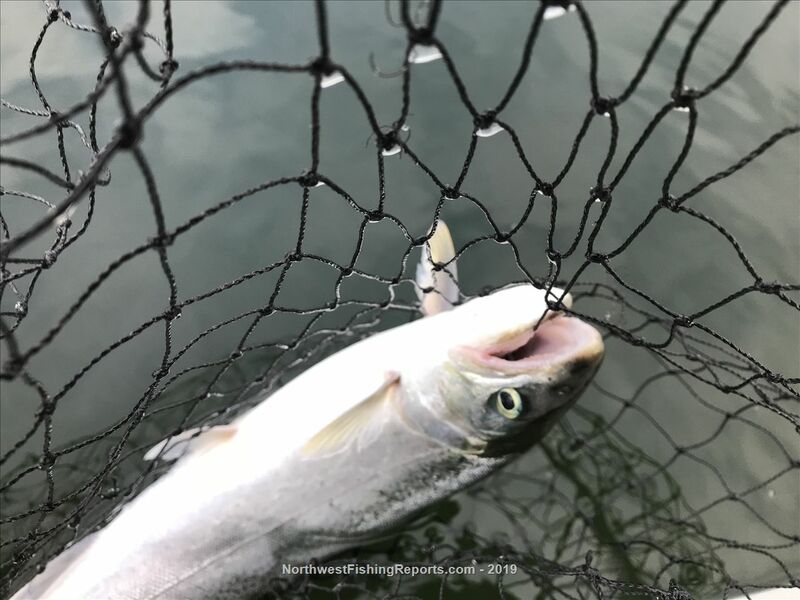 I remember only one kokanee caught in Dec ‘18. They are still rare. Big surprise to see wild coho in Sammamish. Looked up Weber Point....is that not more north than midlake? I saw a few boats working West to East about a mile up from the launch. Silver and Blue and a White and Black boats. Also were you practicing C&R? If so, Santa forgot to bring you a C&R net. Their well worth it IMHO....no tangle ups with the fishes gills plates, teeth and hooks. Most importantly it does a much better job protecting the fish. The Weber point is north mid lake, about 0.5 mi south from Sammamish Landing Park on east shore. About two weeks ago I had good success south from the Weber point in area between creeks on east side. 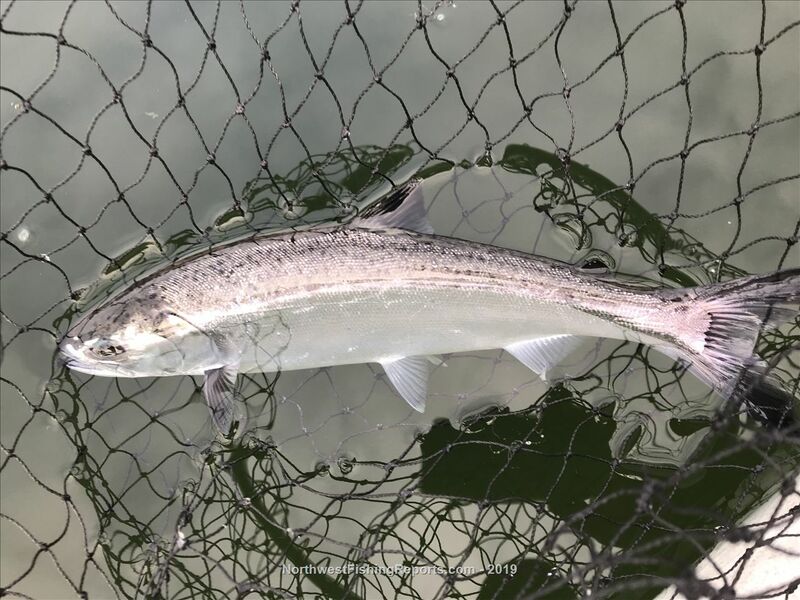 And yes, all fish caught on this trip are available for catching by fellow anglers with exception of the hatchery coho hooked in eye and bleeding badly. I must be doing something wrong. I was the white boat with black trim and a wakeboard tower. I didn't touch a fish all day trolling spoons at 35, 20, or 60ft (the three zones I was marking fish in). Maybe I'm going too fast? I noticed my trolling motor quick release mount wasn't sitting properly and was loose, so I just used my main motor and the slowest I could get to was 2.9mph. Anyone here want to join me sometime and teach me how to troll properly? I will provide the boat and beer. I just need some help. Same goes for when it's time to chase bass in a few months. I am great on the rivers with my fly rod, but I need some help on the lake. Did you have a white motorguide trolling motor on a black mounting plate? I saw someone with a ski boat trying to put on the trolling motor at the launch and seemed to be having problems. 2.9mph could be to fast. ~1.3mph worked well for me in Dec and I do a lot of turns combined with rapid speed change. Also, bow mounted trolling motor is great for trolling in wind but it is hard to do erratic turns. 24-36” drift sock attached to bow and main engine in idle if a kicker is not available could be a better option. Yeah, that was me with the white Motorguide Xi5. Not sure if Bass Pro messed up the mounting plate when it was there for warranty work a few months ago (haven't used the boat since then until yesterday), or if someone tried to take it off the boat, but it's missing some pieces that help the plate lock when engaged. It worked fine before I took it to Bass Pro, I used it all summer just fine. Really frustrating, and I have lost so much of the boating season this past year to issues with a brand new boat I bought from Bass Pro. Every time I take it in for something, it feels like it comes back with new crap wrong with it. A drift sock is a great idea. I've used a 5 gallon bucket off the stern to slow it down if needed, but I usually use an electric trolling motor in calmer weather. The trolling speed is more of a function of the gear you are trolling and the action it has. Dodgers don't do well at higher speeds. One of the reasons I use slingblades as they are good for all speeds. Faster speeds I use larger spoons and 3 to 4 foot leaders. If you're using wedding rings and small dodgers, then I would keep it under 1.8 mph. You can just look over and a watch how your gear is doing and adjust the speed. The boat you had looked like a ski boat and I was perplexed when I saw the bass pro shop cover on the motor and a trolling motor up front. Maybe you should get a fishing boat instead. Just my opinion, but you can fish much easier with a Crestliner or Lund than what I saw. A lot easier to organize and running for bass or trout trolling. FiveFish, were you working that southwest corner with the 5000 seagulls? I saw a sport boat with a big rack working that area pretty quickly New Years afternoon. When my MinnKota batteries run down, I use my Merc which trolls at 2.5ish into the wind. Too fast. Bought a 36" drift sock (sea anchor) and it slows me down exactly 1mph, which is a nice pace 1.5mph for Sammy cutts. So you might need 2, or maybe get the bigger model. I would have a fishing boat, but I had to compromise with the wife in order to justify getting a boat. She wanted a fun family boat, I wanted a fishing boat. So I have a deck boat that has two pedestal seats up front, a nice fishfinder, a Motorguide Xi5 trolling motor with GPS (mainly use it to soft anchor when bass fishing), Scotty rodholders, and an electric downrigger. Definitely going to look into drift socks. Thanks everyone! Also, if anyone wants to get out and fish, let me know. i gotta add, I love the pictures of the fin clip. i have been talking to some members on my previous posts and have been in some discussions of the differences. the main salmonoid problem people should have is distinguishing between a coho and a chinook. if it is not a cutt and has a fin, it has to go back regardless. then you can work on deciphering between the species.